Everyone has played a version of this game as a child, most likely jumping all over the furniture in their living room trying to stay off the dangerous floor. The Floor is Lava is a brand-new game where players must imagine the floor is molten hot lava, while spinning for their color and jumping along foam game pieces in order to reach safety. 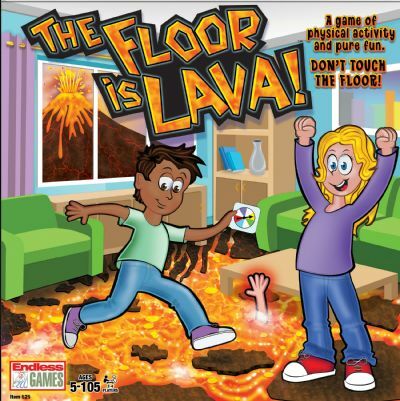 The Floor is Lava is a family game incorporating physical activity, imagination and pure fun! Remember, DON*T TOUCH THE FLOOR!